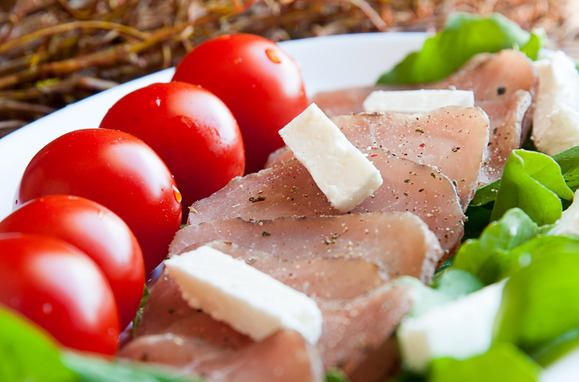 Mykonian louza is one of the tastiest Greek cold cuts. It is characteristic in Cyclades and can be found any time of the year. It is made of local pork and specifically from the steak from the back of the animal which is wrapped in intestine with salt, pepper, savory, oregano and all spice. Traditionally, the preparation of louza on Mykonos took place at the end of an elaborate ritual, the annual pig slaughter, a beloved festival on the island. Experienced butchers would take out the fillets for the pigs and rub them with a mixture of coarse sea salt and fine salt. After rinsing, they would dry them and season them with lots of savory and pepper. Then they would pass the meat through a piece of pork intestine, keep it close with twine top and bottom and dunk each piece once more in brine made from sea water. Finally they would hang them in an airy spot and let the winds of Mykonos dry the meat. The locals enjoy it raw, but this cold cut keeps on getting a more prestigious spot in salad or sandwiches.